In this issue of our Newsletter we wish our regular students happy long vacation while we welcome our sandwich students back to the lecture rooms once more. For our students who have completed their programmes we wish them great success in the National Service or success in their search for jobs, if they do not belong to the group that will be on National Service. 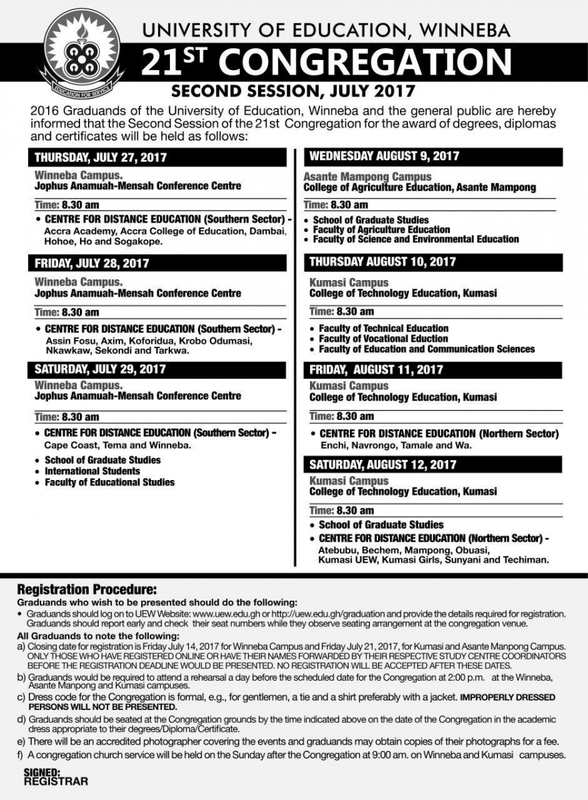 Applications are invited from qualified Senior and Junior Staff of the University for the July 2017 promotions. Requests for application forms should be directed to the Deputy Registrar, Human Resource. Application and Assessment Forms will be sent only to applicants who meet the criteria for promotion as outlined in the “PROMOTION PROCEDURES FOR SENIOR/JUNIOR STAFF OF THE UNIVERSITY” which has been circulated to Departments/Sections. Click here to check their results online. It has come to the notice of the IT Directorate that, some members of staff who subscribed their Personal Vodafone lines to the UEW Vodafone Closed User Groups (CUG) have their lines disabled and are not able to make or receive calls on those lines. The fifth edition of the UNESCO-Hamdan bin Rashid Al-Maktoum Prize for Outstanding Practice and Performance in Enhancing the Effectiveness of Teachers has opened the call for nominations. The Prize of $300 000 will be divided between three winners. The University of Education, Winneba wishes to inform the general public that its offices on all Campuses (Winneba, Ajumako, Kumasi and Ashanti Mampong) have opened for normal business effective Friday 16th June, 2017. Our cherished students, parents and partners are hereby informed accordingly. Our attention has been drawn to some misrepresentations regarding our decision to temporarily shut down the University of Education, Winneba campuses in reaction to the Court directives yesterday 13th June, 2017.